We lived at 11, Cornmoor opposite the shop and The Crown, It was a little ‘Close’ of houses at that time, I remember it backed onto and was surrounded by fields. 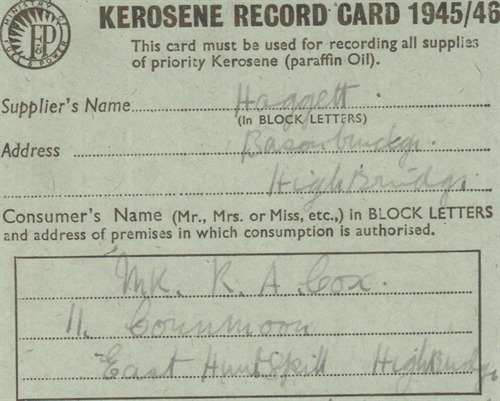 It was a lovely cosy house which we rented for the duration of the war until 1947, I still have the original rent books. 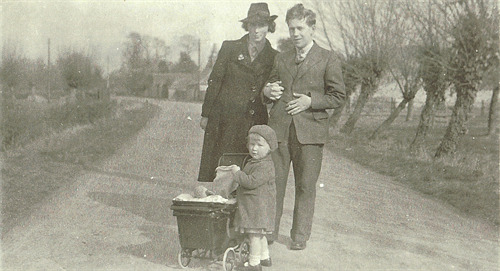 I was a newborn when we arrived in East Huntspill, Maureen lived with us as her mother had died, and she was about three years old. 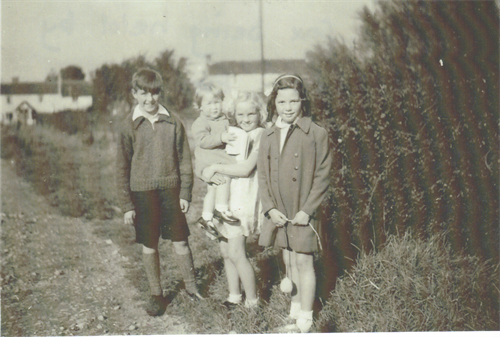 ‘Primrose’ an evacuee from London also lived with us, so I had two wonderful sisters to look after me as well as my Mother. We lived happily as three sisters and our ‘Mum’ as many families did during the war when men were conscripted. I would love to meet ‘Primrose’ again as I am not sure when she went back to London and I remember her with such affection. I have asked The Editor of ‘EH’ to consider starting an article of ‘Where are you now evacuee’s on a regular basis. After all, these evacuees are probably starting to realise that they are a huge part of the social history of England. I have been back to the village twice, the last time in 2009 where we went to The Crown Inn and sat outside enjoying a cup of coffee, I lost myself in happy memories. We went to the shop and bought some apples form a house round the corner. 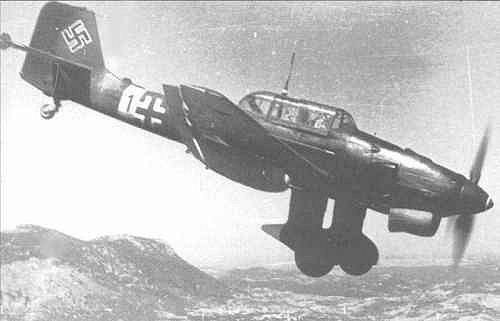 My first memory was being tipped into a ditch when a low flying German plane started to use my mother and me as target practice as we walked into Highbridge. On another occasion she was dragged into a shop as another plane ‘straffed’ the High Street. At some time during the war, a German plane crashed in a field near to us, tis caused great excitement as any available men ran out in their pajamas to capture the German Pilot, who was alive and unhurt, as children, we thought it was a great adventure! We used to go into the fields with huge galvanized tin buckets to pick rose hips for rose hip syrup and blackberries. On one sunny day a whole row of mothers and children were happily chatting and laughing, I was smaller than anyone else, so was getting the lower berries when I became aware of a sudden ominous silence. I looked around and I was alone with all the buckets being tipped over and the contents all over the ground. I then heard a thundering sound coming through the ground, only to realise that a huge bull was heading straight for me. Needless to say I hastily scrambled through the hedge joining the rest of the villagers! Most of all I remember the smell and sounds of the village when lying in the apple orchards, eating the fallen apples. One orchard was by a river which was covered in bull rushes and covered in sweet smelling flowers. I attended a talent show, I think it was linked to the Church and Hall. I sang ‘You are my Sunshine’. My mother was flabbergasted as I must have heard it on the wireless. I won first prize and was only 4 years old. I adored school sitting around a huge table and looking at the ‘ABC’ all around the room. I always liked to consume the cream off the top of the milk, carefully sucking it through a straw. We wrote on slate boards and all my life I have remembered the talented teacher, Miss Short. She taught me to read and write I even won a china cup for math’s! My family lived all over Bristol, with my Grandparents living to the ripe old age of 103 being married for over 70 years. I remember my Grandfather showing me his beloved Bristol after mass bombing. Even though I was not quite 5 years old, it really brought home to me what bombing was all about. VE day , Maureen and I had great fun making our costumes, mine was made of flour sacks with pompoms, and Maureen’s was a hula-hula girl in a raffia skirt! The event was held on a large grass area near the school.